Anchor Trolley System for Kayaking - Do I Need One? Why would I need a kayak anchor trolley? I hear that question quite a bit. Many people are confused on exactly what an anchor trolley does and how it can benefit them when fishing. For the record, an anchor trolley is a way for anglers fishing from a kayak to gain control and flexibility of their boat in situations where the weather or water could prevent them from catching fish. In this article, you'll find a kayak anchor trolley functional diagram plus ways to use them in a second diagram that is showing a few wind or water current challenges a kayak fishermen may encounter and how an anchor trolley can help. Hey, from my point of view, having an anchor trolley on board is a no brainier. What are the Benefits of the Anchor Trolley? 1. An anchor trolley is a way to not just stay in one place but to be able to stay in one place and face the direction that you want to face. 2. An anchor trolley is used so that you can fish into the wind, cross current with the wind or with the wind at your back. 3. An anchor trolley makes it much easier pulling the anchor up and allows total control for the user when anchoring in any type of water. How is an Anchor Trolley Constructed? An anchor trolley has in essence, three main parts. It has two pulleys, a rope, and a ring. The ring is attached to the rope and the rope runs through the pulleys. Once in place, you are able to attach an anchor or more specifically, the anchor rope to the ring and use the rope to slide it forward and back along the side of the kayak to adjust your anchoring point. This is especially important when you are fishing on larger bodies of water or water that has current. There are some people who even utilize an anchor trolley on both sides of a kayak to pin an anchor in the front and pin and anchor in the back, which holds them virtually in one single place. If you're fishing in shallow water, you can replace your anchor with what's called a stake out pole. Many times these are long garden spikes or push poles with a pointed end that you can drive into the lake bottom to hold you in place. An anchor trolley allows you to stay in one specific spot but also it allows you to be safer when you're on the water by using a carabiner clip to attach your anchor rope to the ring on the anchor trolley. If for some reason your anchor rope gets stuck, you can detach the anchor rope. Another cool thing that a lot of people do is put a float on the end of their anchor rope near the carabiner, which if you get into a bad spot and have to detach your anchor rope, you don't lose your rope and all of your anchor, it allows you to detach it, the float floats the end of the rope, you can move around to a different angle, pick up the anchor rope by hand and then try to wedge the anchor if for some reason, it gets stuck. One of the only places I don't really recommend using anchors all that often is in rivers with swift moving current. There are too many places that you can get hung up and flip a boat and bad things can happen. There are certain types of anchors that are very specific for river fishing and I would encourage you to look into those. For general lake kayak fishing, small current situations, or windy situations, an anchor with a detachable rope is a pretty good bet. If you've ever wanted to fish in one particular spot and the wind was bothering you, an anchor trolley could definitely be the answer to less stressful times on the water. Chris Payne has been kayak fishing since 2003 and has made just about every kayak angling mistake in the book. 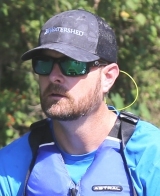 He uses his company Crooked Creek Media to share knowledge (and his mistakes) through several different avenues including Kayak Bass Fishing Magazine, a free online digital magazine and the Kayak Fishing Blog, a website dedicated to unbiased reviews, how –tos and adventures in kayaks. Kayakers, Are You Being Practical About Cold Weather Fishing?